Work on a farm – and see the world for free - ( 1ND144 ) | Best Book "The Great Gatsby"
Lots of farms, especially those involved with alternative and eco-friendly projects, invite people to volunteer in exchange for free food and accommodation. If you’re willing to get your hands dirty, it’s a fantastic way to learn about rural life around the world and enjoy a long-term visit on the cheap. You can look for farms that are open to volunteers through sites such as wwoof.net (World Wide Opportunities on Organic Farms) or Growfood and contact the owners directly to arrange your visit. Most farms require you to stay for at least one or two weeks, but the length of your stay really has to be negotiated with your hosts as it can vary immensely. Some hosts are happy to show you around for a day or two, while others will let you really dig in and stay for several months. 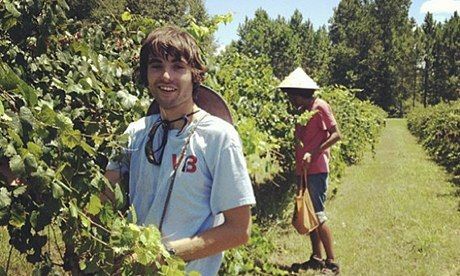 One farm listed on Growfood, Wayback Farm in Maine, invites apprentices to spend an entire season learning about all-natural, biodynamic farming practices. You could be doing anything from picking grapes to building a smokehouse, learning about organic crops or setting up an irrigation system. Of course there are plenty of opportunities out there to milk cows or plough a field, should you wish to partake in some more traditional farm labour. Working days can range from a full seven to eight hours of physical labour to a couple of hours helping with the daily chores. Look carefully though the information listed for each post and make sure to check with the owners beforehand how much time each day you will be expected to contribute. Safety checks on hosts can depend on the organisation and the country you are choosing to visit. Some regional WWOOF groups visit hosts before they are accepted and some do further checks and references, but this isn’t always the case. Some WWOOF groups also have a feedback or reference system where guests can rate the hosts. On the Growfood site, you can find feedback from guests beneath each farm. However, you should still take the same precautions you would normally take if staying with strangers – if you are feeling unsure, you might prefer to go as a couple or with a friend. Advice from an experienced WWOOFER. WWOOF was founded in 1971 by a London-based secretary who wanted to give people like herself access to the countryside and organic movement. There are more than 50 WWOOF groups around the world, so to get involved you need to first choose your destination and join the regional group, which then gives you access to a database of farms that you can contact directly to arrange a visit. Subscription fees for WWOOF groups depends on the country and can range from nothing to £50. Similar to WOOF, Growfood is on a mission to train a new generation of sustainable farmers. The site has a network of thousands of farms, mainly in the US, but also around the world. Listed on the site are opportunites for season-long internships, paid work and volunteer arrangements. Registration is free. Set up to promote better cultural understanding around the world by putting budget travellers in touch with organisations and individuals looking for a helping hand, Work Away lists opportunities where you can exchange a few hours work per day for food and accommodation. It is not restricted to farming; opportunities range from helping out at a hotel in France, developing a project at a peace centre in Norway or volunteering at a homeless shelter in Jamaica. Registration as a single person is £18.50 for two years, or £25 for a couple or two friends. Help Exchange was launched in 2001 and lists host farms, farmstays, lodges, hostels and other similar types of businesses that are looking for short-term volunteers in exchange for food and accomodation. The site is international, but is best for those looking to work in Australia and New Zealand. Volunteers can register for free, but to be fully contactable and for full use of the site, you need to sign up for a premier membership, which costs £17 for two years.